The Northeast Church of Christ occupies a soaring 1972 design of exposed wood beams and steep roof slopes. A central peak over the center of the sanctuary forms a towering skylight. This dramatic architecture creates one specific problem: the worship space is open to the entry lobby. 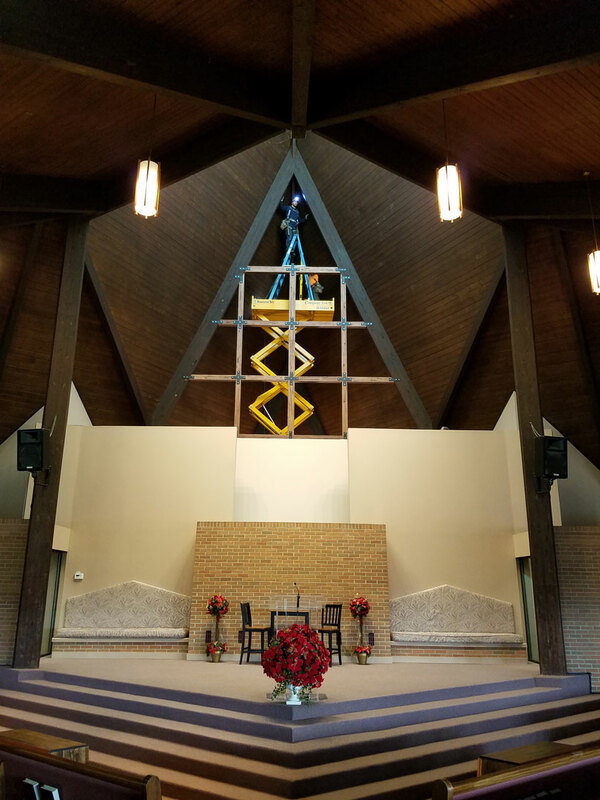 The Church called on Childress & Cunningham Architects to create a solution that would acoustically divide the two spaces and isolate the sounds appropriately. Sound locks with double doors have been added in place of open corridors between the lobby and the sanctuary, but the most notable feature separating the two functions is a heavy timber framed window wall installed just below the apex of the building. This custom architectural element is designed to fit the character of this unique structure, provide the desired sound isolation, and allow the daylighting from the skylight to be preserved in the lobby. Here, the intrepid crew at Glu-Lam Erectors works 45’ in the air, securing the new lattice to the existing structure. Posted in Architecture News Projects Religious .